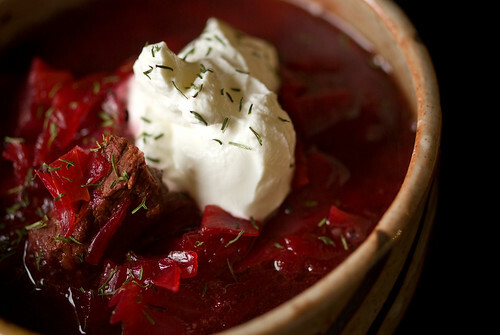 I tend to make pretty chunky borsch – I like the smooth kind served cold with a bit of vinegar stirred in, but I also like a big hearty soup with pieces of beet and potato and beef and plenty of cabbage, and that’s the sort we usually have at home. I usually use beef or lamb broth for the base, if I have any, and dill as the main seasoning. And sour cream on top, of course. This particular batch had a slightly different flavor than usual, as I braised the beef in beer before assembling the rest of the soup, instead of using broth. A friend brought a growler of excellent locally-brewed stout to our holiday party this weekend, and I wanted to use some of it up. I seared the beef stew meat with onions, added a cup of stout, and let it simmer covered for an hour and a half while I roasted the beets and sliced the cabbage. I topped up the soup pot with a little water and added everything else, then let it cook another half hour or so. 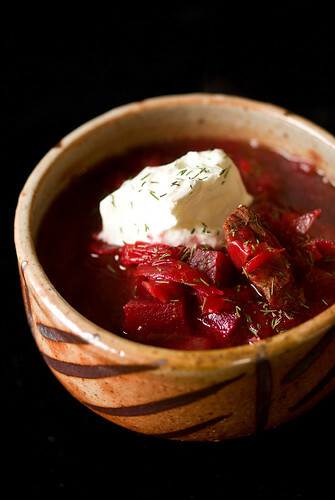 It was a really good borsch, and the beer made it less sweet and a bit earthier. A slice of buttered rye bread would have been the only thing to make it better.